The Holden TA Torana was the third vehicle in a line of three during the second generation of Holden Torana’s released in February of 1974 in Australia only. The TA Torana was a short lived vehicle only produced for 11 months because of the world release of the GM T-car. Production totals around 11,300 vehicles in the Australia market. However, the TA Torana did boast some nice features offering both a 2-dour and 4-door option. The TA incorporated a four-cylinder engine option with either a 1.3 litre or 1.8 litre powertrain. The 2-door and 4-door both had plastic front grilles with revamped rear lights. 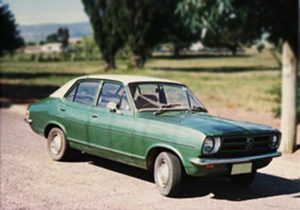 The TA Torana had only two models: the TA Torana and TA Torana Deluxe. 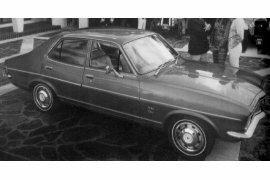 The Torana was the base model with the 2-door option only and the Torana Deluxe was the upgrade with either the 2-door or 4-door option. The standard powertrain engine offered in both the Torana and Torana Deluxe is the 1.3 litre engine (1300cc); however, the Torana Deluxe has the option to be upgraded to a 1.8 litre engine (1760cc). The Deluxe also had the Trimatic auto available as an option either engine option. The Torana Deluxe was fully equipped with carpet, a radio with push buttons, bucket seats with trim, chrome wheels and other features that made the Deluxe the car to buy. 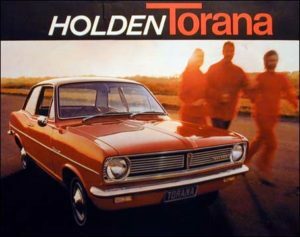 One difference in this Holden vehicle is that it was it did include the new one piece body colour that newer Holden vehicles would feature and it incorporated the body colour grille. The tail lights incorporated a nice silver finish that made them standout and were a new nice touch on the new Holden vehicles. Holden definite tired some of the new touches on this vehicle as it was preparing for its new Gemini vehicle. Internal, cable operated bonnet release now standard. Body side mouldings on Deluxe had PVC inserts (similar to HJ). 1300cc engine improved over LJ, also compression ratio increased. All variants had 10-gallon (45.5 litre) fuel tank. Alternator fitted was same as in six cylinder LJ.